The global success of blockbuster drugs such as Valium, Prozac or Viagra, which generated millions in profits for the major drug companies in the 20th century, is unlikely to be repeated. The profits of the future lie in finding effective treatments for lifestyle conditions such as diabetes, obesity, and the degenerative effects of age. Such treatments may well come from unraveling the mysteries of metabolism – how the micronutrients of a healthy diet work their beneficial effect, and how they can be turned into ‘nutraceutical’ foods, which optimize these beneficial properties. The notion of eating yourself young, slim and healthy is alluring indeed. And it looks increasingly likely that real breakthroughs will be made in this area. It is already well-known that people who eat a lot of fruit and vegetables are in better shape, have less illnesses, and generally live more healthily for longer, than those who don’t. The precise reasons for this remain a mystery, but most food scientists believe it is the so-called secondary metabolites in plant-based foods, which produce this benefit. There are the dozens of chemical compounds involved in organic functioning. These include odour-producing factors in plants; amino acids involved in cell function, or a whole variety of chemicals called alkaloids, which individually have anti-bacterial, anaesthetic or stimulant properties when consumed by humans. The current generation of over 60s has with some exceptions, been relatively unaware of the link between a healthy lifestyle and an enjoyable disease-free old age. However the doctors’ notion of ‘compressed morbidity’ – reducing the length of restricted lifestyle caused by ill-health at the end of life, is gaining currency among younger adults. 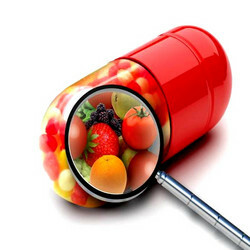 Translating this desire into nutraceutical products with a measurable benefit, is increasingly becoming a focus, and a number of food and pharmaceutical multinationals are working in this area. The first generation of nutraceutical products – probiotic yoghourts intended to promote the growth of beneficial bacteria in the digestive system, are already on the market. Their benefits are unproven, but they are being eagerly consumed by millions of people, demonstrating that there is already a growing understanding of the payback between what you put into your body and what you get out of it. There are also trials underway involving foods containing anti-ageing compounds; studies to observe the long-term effect on heart disease rates of food ingredients with cholesterol-lowering properties, and research to unravel the effect of specific nutrients on brain function. While there are already many studies on animals demonstrating disease-prevention effects from nutraceuticals, proving they also work on humans is a laborious process taking many years. The rewards from success however, will be limitless. Even if we don’t prolong maximum lifespan, preventing the misery of decades of restricted activity must be a worthwhile ambition.